Reetsyburger's Refuge: I'm a taste tester...I'm a taste tester...watchin tests go by. I'm a taste tester...I'm a taste tester...watchin tests go by. About six months ago, I started participating on paid, blind taste test panels. Now, it's not totally random. I had to take prelims in order to qualify, and I've gone through weeks of training to better understand the "complexities of aroma and flavor." 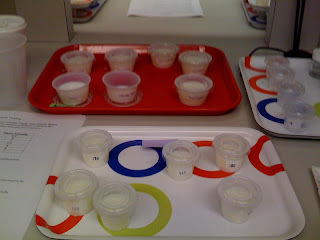 Panelists should be able to detect trace amounts of fresh cream, malt, salt, or soy by aroma and flavor. I can now tell the difference between astringency and chalkiness, which I find cool for some reason. I know! It sounds exciting, but it's not like I get to sample bbq pulled pork or bing cherries everyday. For instance, for the past 3 months, I've been participating in a blind taste test study in which we scale vanilla flavored nutritional beverages. Looks appetizing, right!!??? 3-4 days per week, I smell, sip, and spit countless cups of white, milky, vanilla stuff. Not exactly thrilling. ...............I've been selected to sit on a CHEESE TASTE TEST PANEL! That's right. I'm getting paid to eat cheese. Anonymous - thanks for reading and commenting! I was recruited as a taste tester, and I was trained by that same sensory center that recruited me. I suppose your best bet would be to work with or for a company that is engaged in product development. Northland Laboratories in IL accepts applications online (https://profile.tastetester.com/Default.aspx). Freight House Restaurant by August Schell Brewing Co. Thanks for the help and advice on places in Stillwater! I saw the Savories website and had thought about going there so maybe we'll check it out along with the other places you mentioned. Anonymous - If you hit Smalley’s Caribbean Barbecue, please let me know your thoughts. that's awesome, keep living the dream! I'm insanely jealous, though I supposed you've earned it after all that other tasting. Melina - Word! I hope I don't get sick of eating cheese! Emily - Seriously, the vanilla beverage tests were definitely a bit much. I haven't wanted vanilla ice cream in weeks.